About "SHSAT Math Practice Test Questions"
Thirty of the fifty students who took an exam received a grade of 90% or greater. What percentage of those fifty students received a grade of less than 90%? So, 60% of students are scoring 90% or more than 90% of marks. Hence 40% students are getting lesser than 90% marks. Let n be a number from -3 to 4 inclusive. What is the range of values of n2? 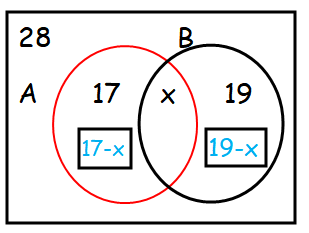 The range of n2 lies between 9 to 16 (inclusive). A is 3 times C. B is 8 less than C. For what value of C does A = B? Hence the answer is -4. In a class of 28 students, everyone likes math, English, or both. If 17 like math and 19 like English, how many like both? Hence the number of students who like both subject is 8. Let x = 32·53·74 and y = 23·3·52. What is the greatest common factor of and y? Common factors are 3 · 52. After having gone through the stuff given above, we hope that the students would have understood, "SHSAT Math Practice Test Questions". Apart from the stuff given in this section "SHSAT Math Practice Test Questions", if you need any other stuff in math, please use our google custom search here.